FATCA Intergovernmental Agreement Exposed as Bad Deal for ‘Partner’ Countries — 1389 Blog - Counterjihad! Foreign Account Tax Compliance Act (FATCA) is a US law that attempts to force foreign financial institutions to report balances, receipts, and withdrawals in accounts that belong to Americans. If a bank or financial institution does not file such reports, the IRS will charge a 30% withholding tax on income from those investments. The United States is the only country in the world which taxes based on citizenship rather than residency, on worldwide income of individuals, in the same manner as residents. First, in issuing the final regulations, the Treasury Department already has exempted “certain retirement funds, life insurance and other ‘low-risk’ financial products held abroad, which are not considered havens for dodging taxes, are exempted from reporting their U.S. account holders’ information to the IRS.” So one might think that the incentive to sign an IGA to protect key industries may be reduced. On the other hand, for some jurisdictions, even the final regulations “confuse rather than clarify” on that point, so some industry is still pushing for an IGA “to provide further clarity” and specifically include “in the annex to the IGA . . . a list of exempt institutions/products.” Or to put it another way, even after issuance of the “final” regulations, vagueness and fear remain Treasury’s key tools for pushing countries into IGAs. 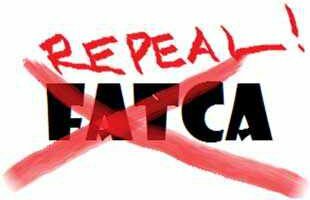 Originally published on Repeal FATCA. All this talk about the treaties and tax laws is the same as rearranging the chairs on the Titanic. The congress agrees with the public that the tax code is a mess and every attempt to straighten it out, only makes it more complex. They all know that we need to repeal all Federal Tax Law, repeal the 16th amendment that allowed a tax on income, disband the IRS and pass the FairTax. I suspect that every politician who now can now extort campaign contributions with tinkering with the tax code, would rather eat their children than fix the tax code. The FairTax would fix the whole system and we all know it, but getting anyone who has power to give it up, is like pulling teeth without any deadening agent. FATCA: Why foreign banks won’t take Americans — 1389 Blog - Counterjihad!